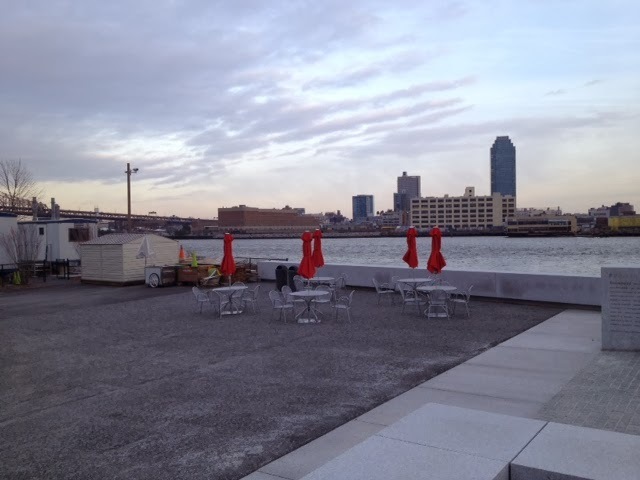 Cornell NYC Tech Vice President Cathy Dove sends this report to the Roosevelt Island community. Many thanks to everyone who braved this crazy winter weather to join us at the Cornell Tech town hall meeting earlier this month. Despite the slush and bitter cold, more than 125 Islanders came out to hear the latest progress on campus construction and to take part in a great discussion. We were also honored to be joined by our new Council Member, Ben Kallos, and Deputy Borough President Aldrin Bonilla. This week’s column is devoted to recapping the town hall, but first, I would like to acknowledge and thank Ellen Polivy as she steps down from the Roosevelt Island Residents Association. For more than two years now, Ellen has been a constructive critic and tireless advocate for Islanders, helping us understand what is important to her neighbors. She has always acted in the best interests of the community, while working with us constructively and collaboratively to ensure our campus will be an asset to the Island. We will miss Ellen in her role at RIRA, but are grateful that she will continue to be an active member of the Cornell Tech Construction and Community Task Force. The town hall meeting was held on February 5th and was co-hosted by the Construction and Community Task Force, which was instrumental in putting together what proved to be a very productive and engaging agenda for the meeting. The task force is a critically important group, providing advice for our team, a forum for keeping the community updated and a group of knowledgeable citizens to raise questions in real time. Our team made three presentations at the town hall. The first was given by Andrew Winters, Cornell Tech’s Director of Capital Projects and Planning. Andrew is overseeing the campus construction and he gave a broad overview of the project phasing, timeline and design, noting the arrival of the first barge on January 21. He reminded everyone that we are committed to using barges for all aspects of the demolition and abatement phase, which is scheduled to go for almost a year. He also described the fencing around the site and the need to close the eastern roadway and promenade in order to ensure the barging operation is conducted safely. In the near future, the western roadway will be turned into a two-way street, with a turn-around at the end to accommodate vehicular access to Southpoint and Four Freedoms parks. Finally, Andrew filled everyone in on the water main break that occurred on the campus site. A team focused on doing test borings hit an active water line. Residents’ water was never polluted nor compromised, but the incident has led us to revise our drilling procedures and also revisit procedures with RIOC to get immediate and clear information out to the community. Aric Domozick of PAL Environmental Services then gave a detailed presentation on the work his company is overseeing related to the abatement and demolition of Goldwater Hospital. Aric stressed the focus on safety that his company and the entire Cornell Tech team are bringing to the project, beginning with the abatement but continuing throughout the project. He also described the sequence and approach to demolition. 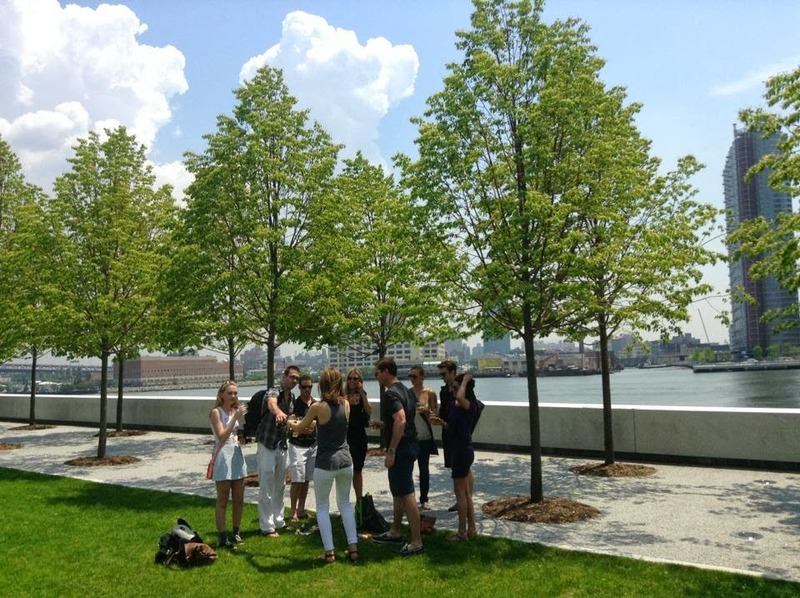 Then Karen Tamir, our landscape architect from James Corner Field Operations (the group who designed the High Line among many other outstanding projects), gave a quick update on the exciting open space plans for the campus. While these plans are not yet final, Karen and her team are designing a unique set of urban public spaces that will be open to the community, populated with native species of beautiful plants, and take advantage of the spectacular views. This is one of the most exciting aspects of the campus and we look forward to sharing final designs soon. The last half of the meeting was an opportunity for Islanders to ask questions, provide input and hear directly from the Cornell Tech team. As always, there was a terrific energy and enthusiasm in the room and we appreciate everyone’s participation. I hope that the town hall was informative and helpful to those who attended, and I look forward to seeing even more people at the next town hall meeting later this year. In the meantime, all of the latest information on the campus and the construction process is available on our website at construction.tech.cornell.edu. Stay warm and dry! Here is the full video of the February 5 Cornell NYC Tech Roosevelt Island Town Hall Meeting. and Politicker has audio of Mr. Kellner's announcement provided by the campaign of Ed Hartzog who is seeking to replace Mr. Kellner. The NY Daily News Celeste Katz Daily Politics Blog has more on the Democratic Party battle among candidates to succeed Mr. Kellner. As I reported in January, a power struggle between supporters of two hopefuls eyeing Kellner's seat -- regardless of whether he stayed in the game or not -- led to some bad blood on the East Side. At the time, investment banker Gus Christensen tried to pack a group in Kellner's district, the Lenox Hill Democratic Club, by underwriting $2,600 in dues for friends to join just before the club picked a president to replace businessman David Menegon, who's also on a mission to succeed Kellner. Ostensibly with an eye to getting the club's endorsement for Assembly, Christensen ended up winning the vote -- although his backers insisted he could have done so without opening his wallet. Click here for the entire post by Ms. Katz. Corey Evans is another candidate expected to try to replace Mr. Kellner. As far as I know, there is no current Democratic Party club on Roosevelt Island. It will be interesting to see if Roosevelt Island Democratic Party members line up behind one candidate. 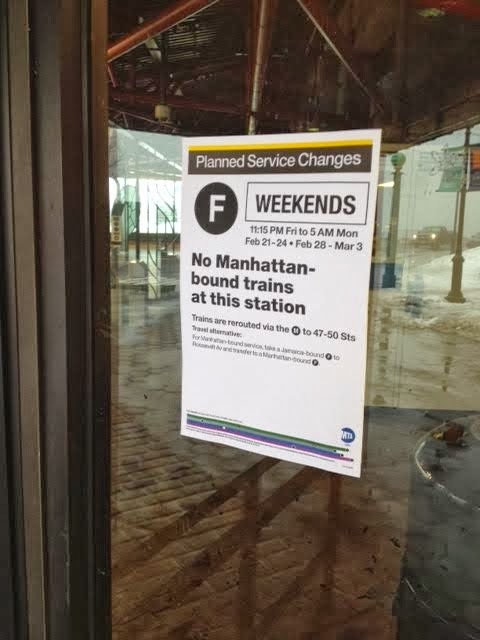 At least better transportation access to Astoria this weekend. 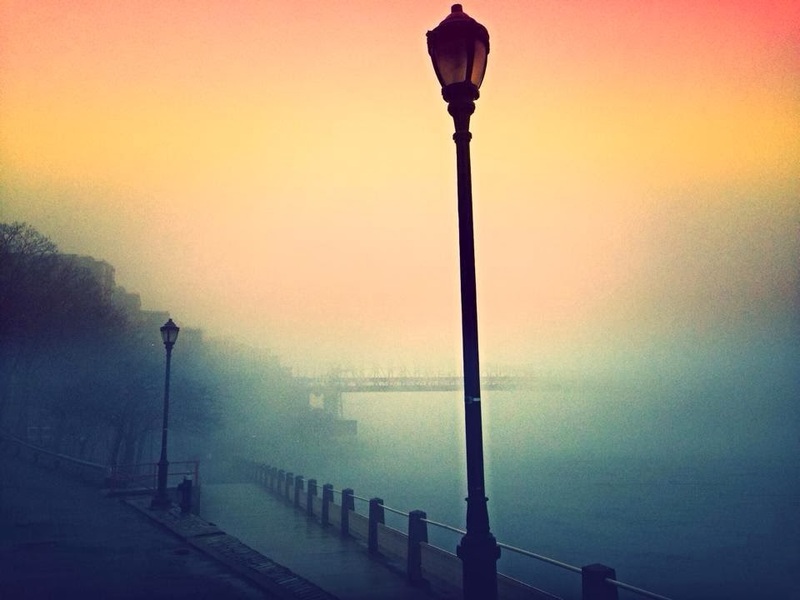 Very heavy fog vanishes portions of Roosevelt Island and Manhattan today. 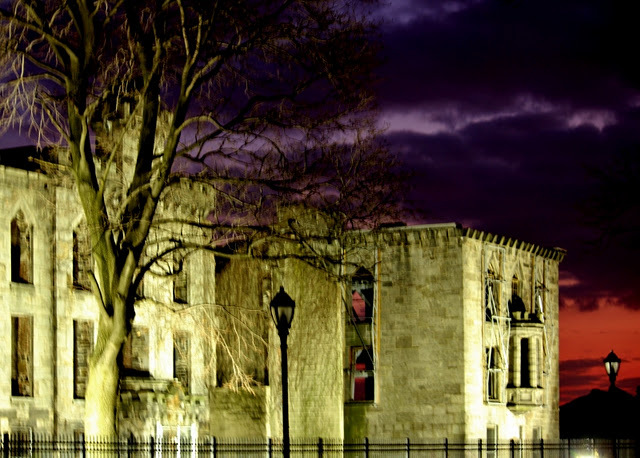 and cool video of the Ruins mistaken for a Scottish Castle. RIOC would like to extend its thanks to Roosevelt Island drivers for responding quickly to the Snow Emergency advisories and moving their cars off the streets. Your cooperation has helped us keep the streets clean and safe throughout the consecutive storms that have affected Roosevelt Island. We thank you for your patience and for your kind words of encouragement to our staff members on the streets during this exceptionally stormy winter. We would also like to recognize the hard work of our snow removal crew for dedicating over 1,100 man hours to snow preparations and removal since mid-December. As a reminder, in the event of a Snow Emergency, free 24-hour parking is available for Roosevelt Island residents inside the Motorgate Parking Garage (688 Main St.) in non-reserved spaces. If you have any questions or difficulty finding a parking space, please contact the Garage at (212) 832-4585 or the Roosevelt Island Public Safety Department at (212) 832-4545. You may also visit Motorgate’s offices, located on the 4th floor of the garage. Sportspark is aiming to make information about classes, programs and facilities more easily accessible online. To that end, we are pleased to announce the debut of our new Parks & Recreation website. Starting today, Sportspark patrons will be able to view a calendar of programs and available classes online, register and pay for some classes, manage and update contact information as well as access important forms & information online. Online registration is currently only available for the upcoming session of Mommy & Me water safety classes. If you would like to try out the new site, you can visit rioc.recdesk.com. We encourage you to try out the new site and let us know what you think. You can report any questions, comments or issues you have to eddie.perez@rioc.ny.gov; we look forward to receiving feedback from the community as we improve this new interface. On February 14, 2014, a mechanical malfunction at the Sportspark Pool required the temporary closure of the facility. Emergency repairs were performed and the Pool is now open. We apologize for the inconvenience caused to the community and thank you for understanding that in order to keep the Pool in good condition, closures are sometimes necessary. We will continue to do our best to maintain the Pool and ensure that it is open and available as often as possible. Weather permitting, the Tram will be undergoing scheduled repairs on Tuesday, March 4, 2014. In order to lessen the impact on travel plans, the work will begin at 10:00 p.m. and take place overnight. The Tram will resume operations at 6:00 a.m. on Wednesday, March 5, 2014. New signs stating playground rules and regulations have been installed at the Blackwell Park Children’s Playground. Based on the concerns and desires expressed by the community, the playground has been designated for use by children under 50” in height. This maximum height is based on the average height of a nine year old child, the upper age limit which was agreed upon during discussions with concerned residents. This will effectively address one of the primary issues brought to our attention by Island parents – that of larger children playing alongside very small children. We are grateful to the community for working with us on this project and are hoping to provide a safe, fun experience for all who will use the Playground. Frequent travelers on the Red Bus are reminded that beginning April 1, 2014, the $0.25 fare will be eliminated. Travelers are encouraged to use any remaining balance on their fare change cards before this date. If a balance remains on the card after the cutoff date, refunds will be available at the RIOC Bus Garage (680 Main Street) until April 30, 2014. If you have any questions, please call (212) 832-4540 for more information. A NYPD Press Spokesperson reported that officers from the 114th Precinct responded to a 911 call of a gun spotted at 580 Main Street (Roosevelt Landings). Upon reaching the 4th floor of the building, the NYPD officers observed a gun on a ledge and arrested 3 persons in close proximity to the gun. RIOC PSD Director Jack McManus adds that PSD received an anonymous call about a gun being spotted at the location. PSD then called 911 and NYPD responded. Roosevelt Island criminal justice and public safety issues will be the subject of a Town Hall Meeting on Monday, February 24. 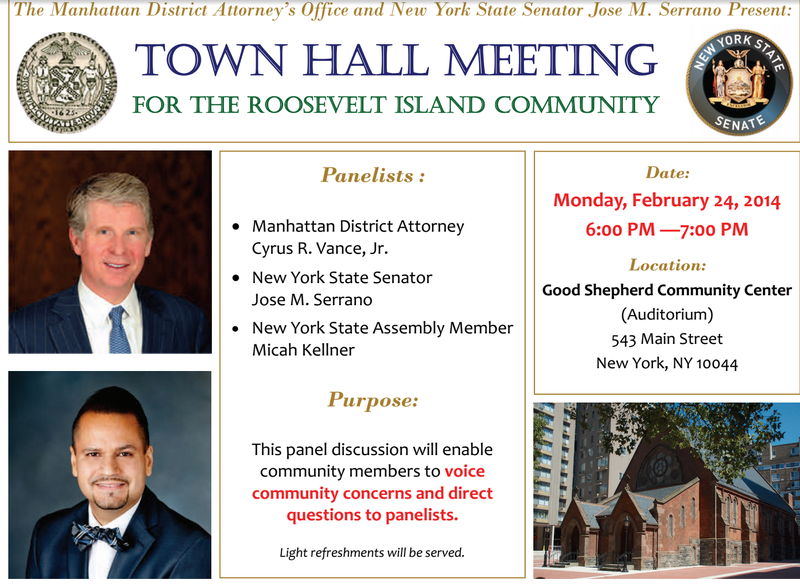 Senator José M. Serrano and Manhattan District Attorney Cyrus R. Vance, Jr. are sponsoring a very important Town Hall Meeting for the Roosevelt Island community. Attendees will have the opportunity to interact directly with DA Vance and our local elected officials, while learning more about the services provided by the District Attorney's office. Do you have concerns about public safety and the role of the DA's office? Suggestions or questions? The panel, which will include DA Vance and Senator Serrano, will lead a discussion enabling Roosevelt Island residents to have their voices heard. Please join us! This Town Hall Meeting will take place on Monday, February 24th, from 6:00pm-7:00pm at the Good Shepherd Community Center Auditorium, located at 543 Main Street, Roosevelt Island, NY 10044. This is an important meeting. Hope to see you there. UPDATE 2/26 - According to a Manhattan District Attorney's Office representative, the weapons charge was dismissed. The weapon was a BB gun. A charge of marijuana possession remains. Comedian Chris Williams tweeted today that he never met a NY'er bragging about living on Roosevelt Island, though he says we do have a cool cable car. @Rooseveltisland people go on how they are from Brooklyn etc..but I haven't meet anyone who brags about RI. You have a cool Cable Car! The Roosevelt Island Twitterverse quickly responded. @thatbritguynyc @rooseveltisland that's a statistical bias. You haven't met many people from RI because we're few. Many of us love it! @notSoJunkDNA @Rooseveltisland @thatbritguynyc I grew up in RI from 95-00 and as a global nomad 3rd culture kid- its one of my fav places! @thatbritguynyc @Rooseveltisland we love it here lived on UES for 10 years before we moved here!! Not leaving anytime soon. @notSoJunkDNA @Rooseveltisland @thatbritguynyc RI has only been residential for 30 or 35 years and so little tradition (yet) of lving there. @thatbritguynyc @Rooseveltisland RIers are less insufferable than the people who insist you know how cool they are b/c they live in Bklyn. @notSoJunkDNA @thatbritguynyc @Rooseveltisland - We are very few, and it is a great place to live! We do need better restaurants though. 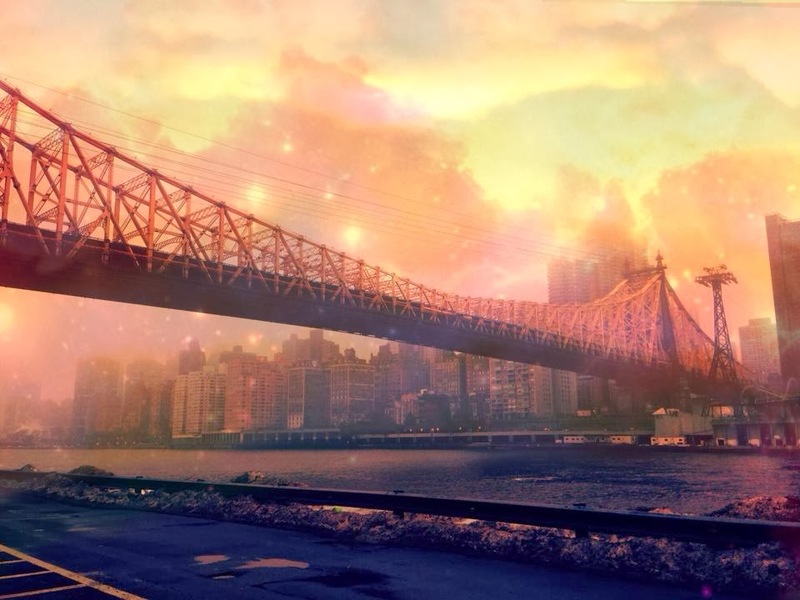 @thatbritguynyc Umm...Chris...proud New Yorker here who grew up on Roosevelt Island. You wish!! I wanted to mention to you that we love the park, but would love it even more if it was possible to eat and drink there, especially as private parties do have events with catering there. There are many families who live on RI and are prevented from visiting your park (or visiting it relaxed, or for longer periods of time), as they are not allowed to feed their babies there. Another point is transportation: Disabled citizens have no access to the Memorial, which is too bad - perhaps there could be a number a citizen could call to be picked up with a small bus or a golf cart, or even pre-book, to be able to visit? I would appreciate if you could forward these wishes to the appropriate contact people in your organization. I am happy to be in touch with them for further co-operation. on a warm sunny day. At first glance, many of our regulations appear strict, but part of our mission is to preserve this monument to our great President Franklin D. Roosevelt. Since we opened, we have strived to improve in order to make the park rewarding to all of those who visit. Last summer, we designed a seating area for those who bring their lunch. It's located on the west side of the park with beautiful views of Queens. 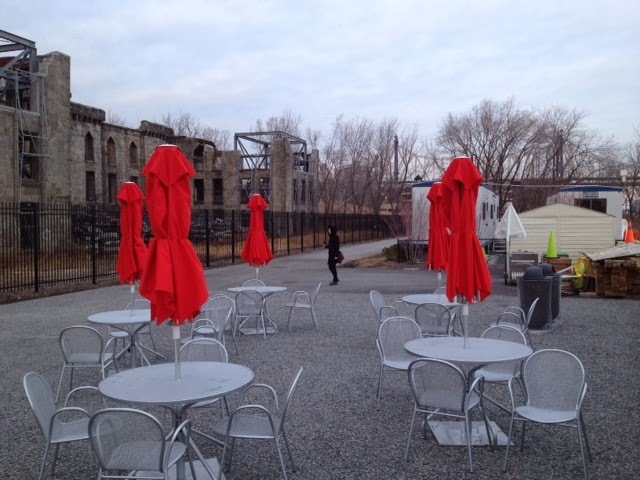 The area includes 5 tables with umbrellas and 25 chairs. For those who do not bring their lunch, we offer a food station where sandwiches and salads are sold during the warmer months, 3 days a week. We hope to have the food station back by April. We don't allow any food and beverage on the actual memorial for fear that it will damage the raw granite and invite unwanted vermin onto the lawn. We agree with you that arriving to the park can be challenging. We wish that there was parking available for ADA visitors closer to our entrance. To alleviate this concern we offer golf cart transportation to and from the tram and subway station. We receive calls and emails for transportation assistance. Typically its booked in advance at no charge to the visitor. We can usually provide transportation assistance without notice too although notice is appreciated. 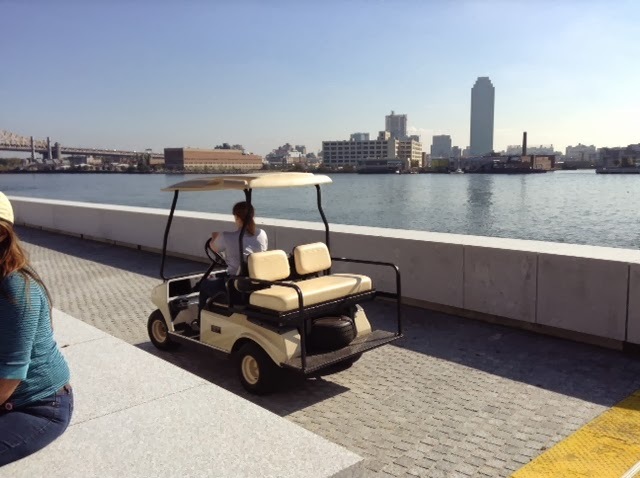 We also offer the option of parking inside the park for ADA and offer wheelchairs to those who need it or even a mini tour of the park in the golf cart. We offered this last year to a World War II veteran and it was a rewarding experience for us all. Now that the red bus is no longer traveling to our side of the Island, we have added an additional street licensed golf cart to meet ADA transport needs. We are constantly evaluating what we can do to make the visitor's experience a pleasant one. Suggestions are always welcome. to and from the Tram and Subway station. Contact information for the FDR Park Conservancy is here. Roosevelt Island Restaurants Rat Free Says Report - Really, Is That True? ... Steven Melendez took the restaurant inspection data from the Health Department and looked at all the inspections since Jan. 1, 2013. Then he counted the total number of inspected restaurants and number of restaurants that received citations for "evidence of mice or live mice" or "evidence of rats or live rats" in that time period for each zip code. Then, for each zip code, he added to the info window any restaurant that currently has a C grade and was cited for mice and/or rats in its most recent graded inspection. Do you think Roosevelt Island restaurants are rat free? Here's the most recent NYC Health Department Restaurant Grade inspections for Roosevelt Island. Good news. Everybody got an A. PLEASE TAKE NOTICE that the Operations Advisory Committee of the RIOC Board of Directors meeting previously scheduled for Thursday, February 13, 2014 has been rescheduled and will be held on Thursday, February 20, 2014 at 5:30 p.m. at the RIOC administrative office, 591 Main Street, Roosevelt Island, New York. Please be advised that following a previous closure, the Sportspark Pool has been reopened. Update 2/21 - Here is the audio web cast of the meeting. Congratulations and Best Wishes to Bernard & Amy on your Roosevelt Island Tram wedding. 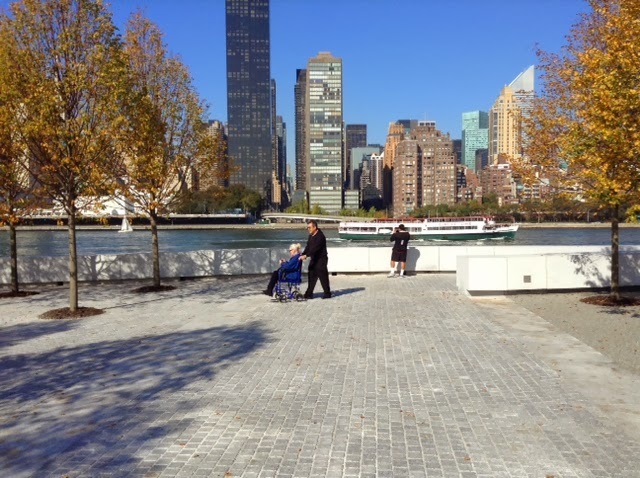 There was another Roosevelt Island Tram wedding last December and a wedding proposal too. Roosevelt Island is for lovers. Manhattan District Attorney Cyrus Vance will be coming to Roosevelt Island to hold a Town Hall Meeting on Monday February 24 from 6 - 7 PM at the Good Shepherd Community Center (543 Main Street). There will be a panel discussion followed by questions from the community. Our office is holding a town hall meeting on Roosevelt Island in partnership with Senator Serrano’s Office on Monday, February 24th at 6:00 PM. New York State Assembly member Micah Kellner will also join the panel. This is a great opportunity for residents to express their views on Roosevelt Island Criminal Justice and Public Safety Department (PSD) issues to the Manhattan DA and our elected representatives. For more background on some of these issues, check out previous posts, the Roosevelt Island Operating Corp (RIOC) December 2013 PSD Audit and this video of Roosevelt Island Residents Association (RIRA) Public Safety Committee meeting with new PSD Director Jack McManus last September. More video from the RIRA meeting with PSD Director Jack McManus at this previous post.